Over the years I've gotten so tired of the flimsy knit, fleece or otherwise impractical mittens for kids. None really keep their hands warm or dry. 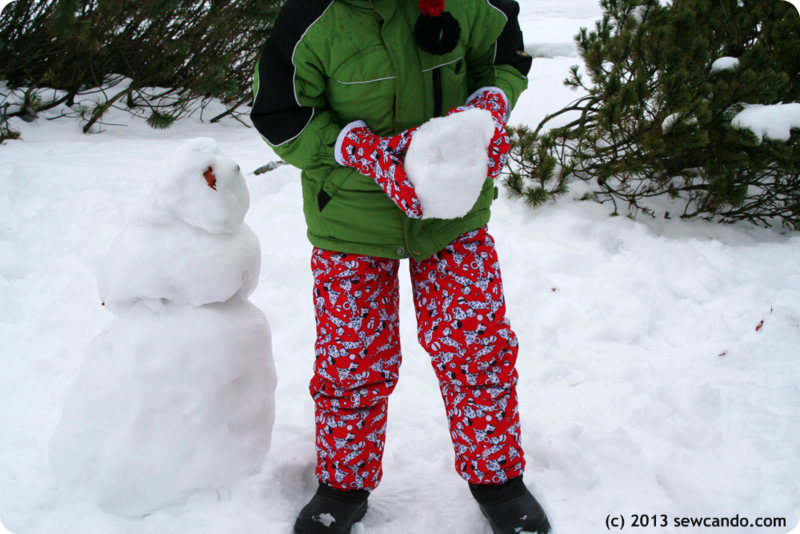 We needed some really robust mittens that could take snowballs, sled rides and other snow-related activities. 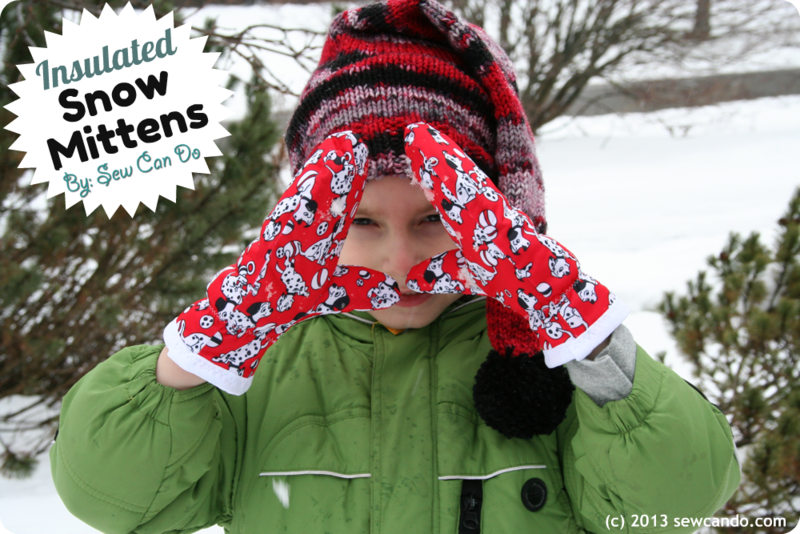 Winter can be downright frigid and little hands need to stay toasty! 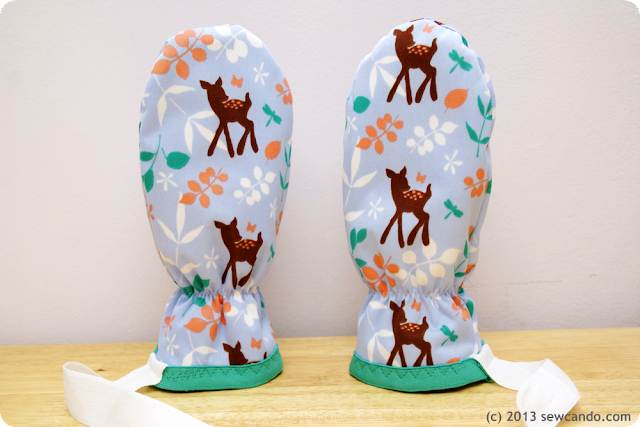 Sooooo, I created these babies: Insulated Snow Mittens. 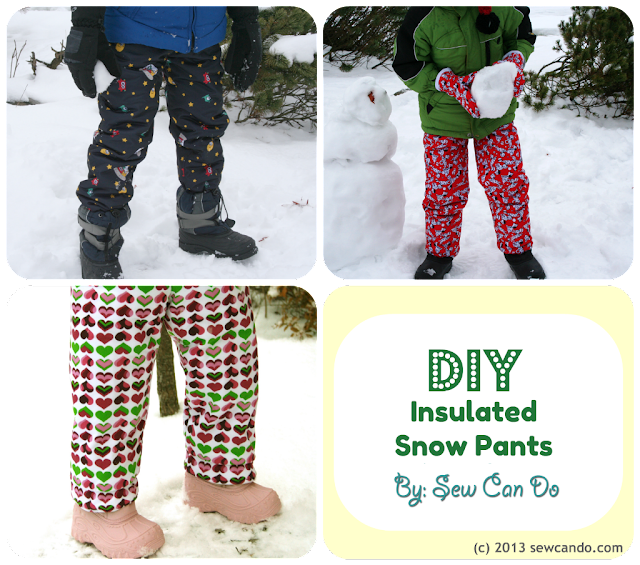 Earlier this week I shared my DIY Insulated Snow Pants and these mittens use all the same materials. This makes them waterproof on the outside, cuddly soft on the inside and with a thermal layer in between to really keep out the cold. The trifecta of a great mitten!! 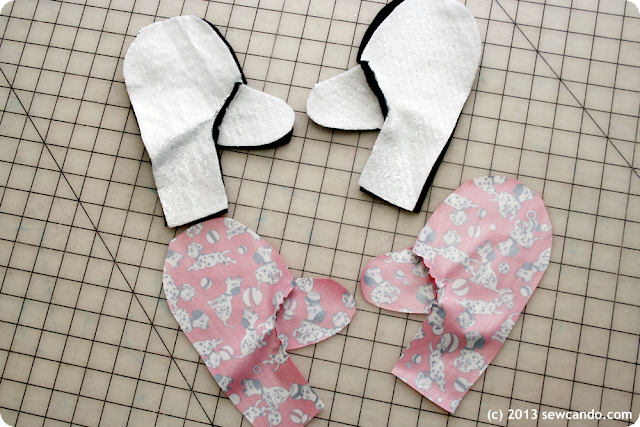 Added bonus, if you make the snow pants, at least 2 pairs of mittens can be made with the scrap fabric leftover! 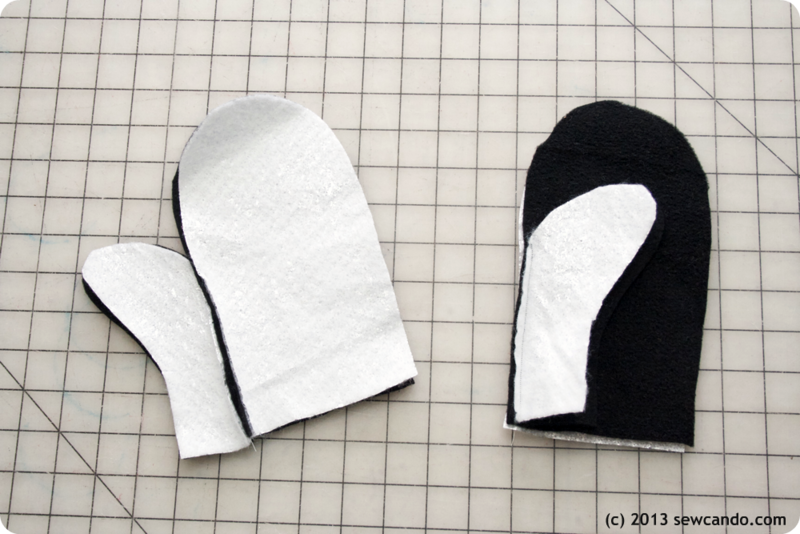 Note - The fabric amounts below are in case you're only making mittens. This will make several pairs and fit approximately ages 2-8yrs. 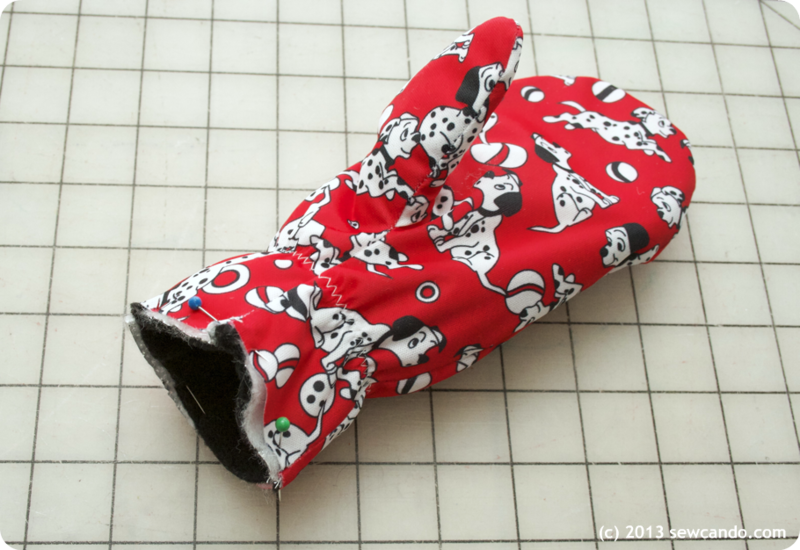 - 1/4 yd Anti-pill or Micro Fleece, which makes a cuddly, hardwearing lining. - 1/4 yd Thermal Batting aka Insulating Lining, (traditionally used for making hot pads). It's needle pricked with silvery mylar to add the critical insulate so the warmth stays in & cold stays out. - 1/4 yd PUL (polyurethane laminate), a laminated polyester traditional used for making cloth diapers - ideal because it's waterproof and lightweight. - 1/2 yd FOE (fold over elastic) - Find more info on using FOE here. Start by printing pattern. Make two copies of first page. Cut out one as the top of mitten piece and the other with the curved section removed for the bottom (see notes on pattern). Cut thumb sections from second page. Fold fabrics in half and cut out pattern pieces from the PUL, batting and fleece, so you will end up with a pair of each piece. Lay batting on top of wrong side of fleece pieces. With right sides together, sew one long thumb piece along one side of a top piece with a 1/4 inch seam allowance. Make sure to sew the next long thumb onto the opposite side of the other top mitten (or you'll end up with 2 mittens for the same hand!). Repeat sewing step with PUL. 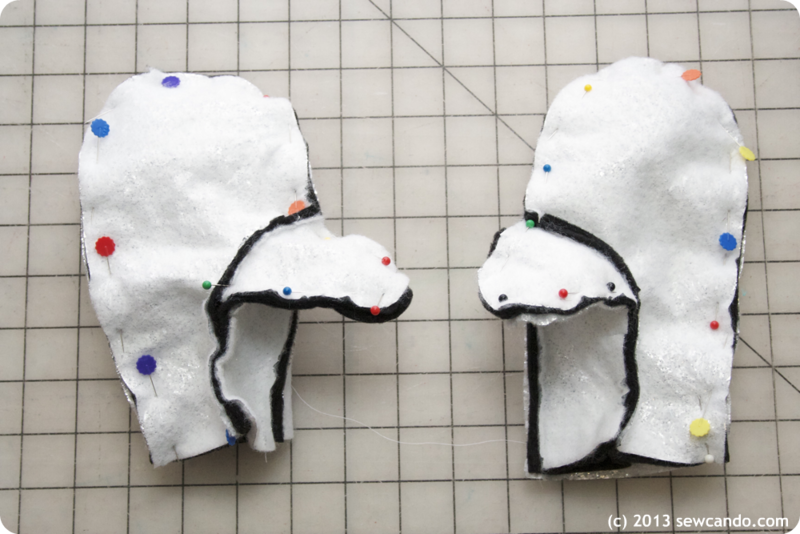 Now take the top and palm PUL pieces and, with right sides facing, stitch down the long (non-thumb) side only and open. With wrong side of fabric facing up, and starting 1.5 inches inward from the cuff edge, attached the quarter inch elastic with a wide zig-zag stitch, pulling elastic taut as you sew. 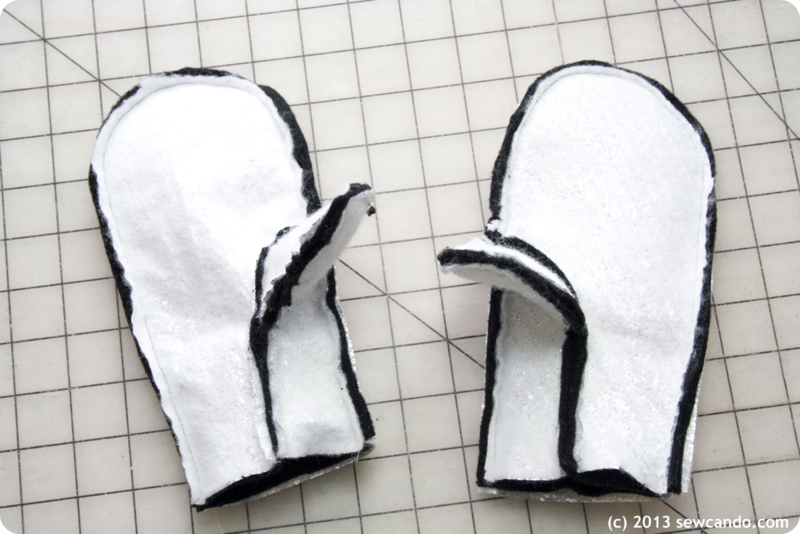 This will create a nice gather effect to help keep the mittens on. Cut off remaining elastic. Turn PUL mittens right side out and insert linings into them. Match up seams and pin together around raw edge. Baste layers together, close to the edge. Finish raw cuff using FOE (fold over elastic) as a binding, sewing into place with a triple zig-zag stitch close to the edge of the FOE. Toss in dryer on high for about 10 minutes to seal the needle holes in the PUL. Now the mittens are ready for snow! I also made a toddler version without thumbs (just using the top pattern piece for both sides) and inserted one end of a strip of twill tape under each mitten cuffs as I stitched them on so they'd be the "on a string" variety. I think some snow bunnies are ready for action!! I'm also sharing this with my FAVE LINK PARTIES. These are adorable. I would love to have you share this with this weeks Wednesdays Adorned From Above Blog Hop. It runs from Tuesday night through midnight Sunday. Here is the link to the party. Oh my, I think I could actually make those following your directions!! My future grandchildren will have warm hands their whole lives thanks to you! Out of a large party, Cheryl, I always pick your items to view! 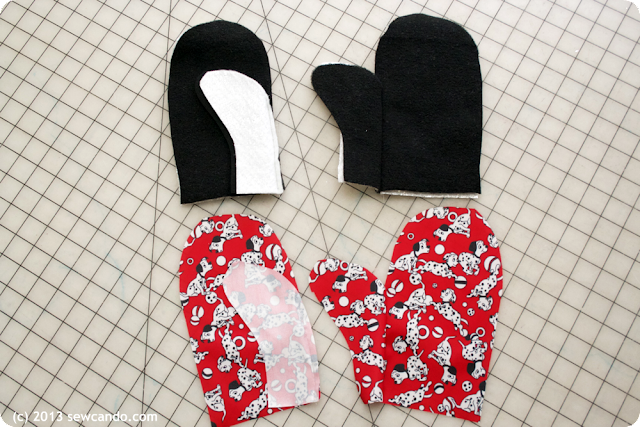 Nice tutorial on these mittens. Beautiful sewing also. I pinned this for future use! I love to sew also. Take care, Linda would love to have you link these up to my What to Do Weekend Party also. Another very easy to follow tutorial, Cheryl. 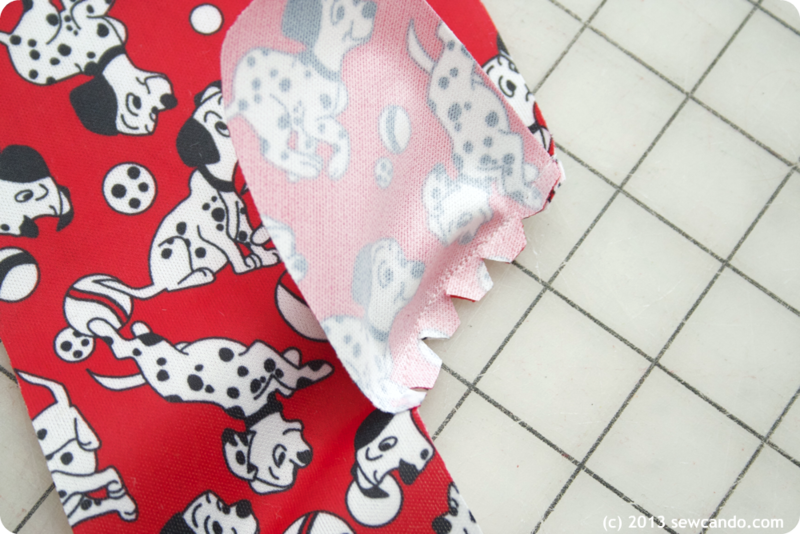 LOVE the dalmatian fabric!!! Thanks Pam - I love that fabric too. I'd been eyeing it for some time but didn't know what to use it for. Now we use it everyday and it's great! Adorable, Cheryl! 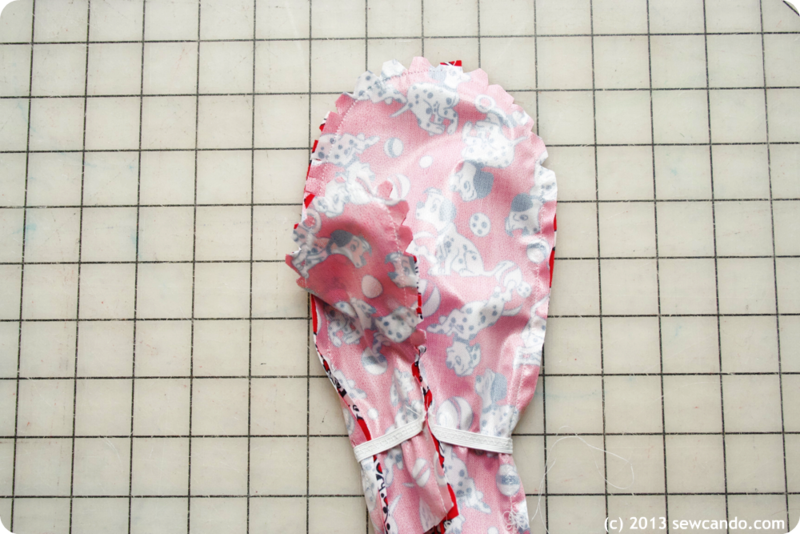 Fabulous tutorial, thanks for sharing!Love the fabric too! I love you sewed the twill tape in place to thread through a coat! Those are absolutely brilliant. Wish I had those when mine were all little. Thanks for taking the time to put up a tutorial. I was just saying that my mittens were no longer waterproof and my hands are always cold so these sound delightful. Sorry, this is a pattern I created for my kids, so I don't have additional sizes to share. You could probably add an extra 1/2 to the width to one side and extra inch or so to the length of the top and bottom pieces to size them up. I was wondering the same thing. My sisters, aunt and myself have neuropathy and our hands get cold so quickly and it's hard to get them warm once they do. Thanks for the sizing info. I'm going to give these a try! 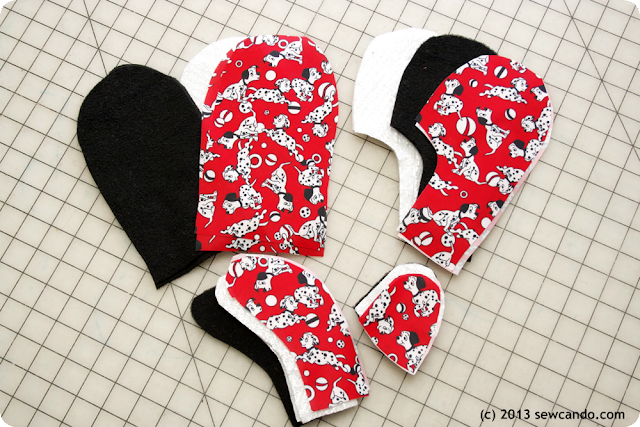 What a wonderful pattern and fun fabric for mittens! I'll be pinning this so I can refer to it later. 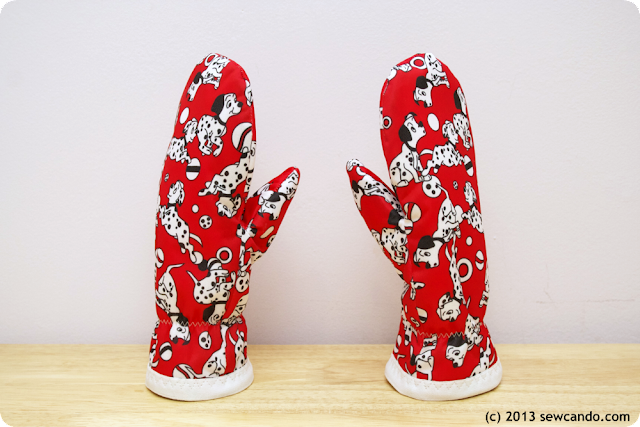 I've never sewn mittens, but you made it look like fun! Thanks Laurie. Mittens are a really fun project - pretty quick and very useful!! would you make a pair for my two year old son with the thumbs in? I would pay you for materials, time and shipping!!!! I'm sorry I don't make items for hire, just share my patterns & how-to's for others to make them. Thanks so much for coming by and visiting our blog and sharing your awesome project. Come by again and link up some more awesome projects in our Saturday Showcase again next week! Love those bambi mittens!!! Thank you for linking it up at the party at http://www.finecraftguild.com. See you back on Wednesday, I hope! Super cute! Did you use a 1/4" seam allowance? That's what it looks like from the photos, but I couldn't find it in the directions or pattern. Thanks! Sorry for commenting on an old post, but do you think it would work to just make the PUL layer for existing mitts? I have a great pair of down mitts but they aren't wind/water resistant at all. My daughter also has decent fleece mitts but obviously they don't stay dry. Also, is there anything I can stitch/glue on to give more grip in the palms or have you not found this to be a problem? Thanks in advance! Probably, although getting the size for the PUL just right would be hard without taking apart the current mittens. We've never had issues with grip, but you could probably dab a bit of puff paint dots (like some do on the bottoms of socks). Made these to my children at 2 and 5 years old. I printed the pattern at 90 % scale. At this scale they are a bit wide and long to my 2 years old, but she can grow with the mittens, and a just fitting/a bit small for my 5 years old. I added 1 cm (3/8") to the width (pinky finger side) and the length (cuff end) of the shell layer (only) otherwise the liner was too big for the shell. I made the following additions to the step-by-step guide: (1) I fixed the two liner layers together by sewing them together with 3 lengthwise straight stitches. (2) To make it easier to add the fold over elastic to all 3 layers at once and still get a nice finish I sewed the two liner layers together in the cuff end before putting them into the shell layer. I then sewed the two liner layers to the shell layer in the cuff end before adding the fold over elastic. 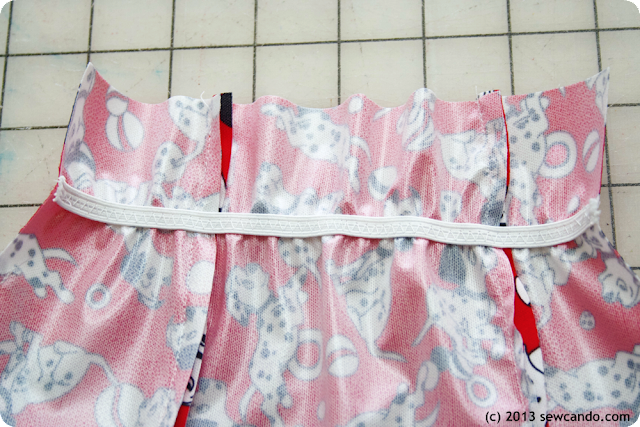 In this way, all three layers are fixed together and are easier to handle when adding the elastic. Nice modifications and having grow room makes them last a long time. Could you please explain which way the reflective side of the insulated lining is placed? 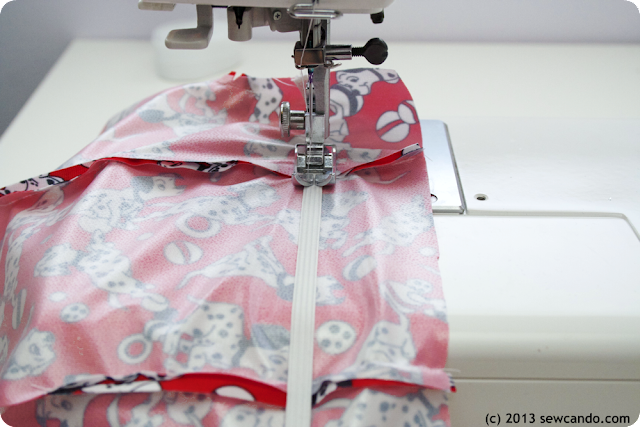 towards the inner lining or the outer fabric. Thank you!! There is no "right side" to the insulated lining. The mylar is needle punched into the material so either side is the same. Ahh the stuff I got is called insul fleece and has one silver side and one white side...I am assuming the reflective silver side faces in?? It's still punched into the material so no matter what it'll insulate from either side, but having the reflective side face inward couldn't hurt. Thanks. I don't actually, but I did use a good slip sock pattern here: http://www.sewcando.com/2012/01/slipper-socks-pattern-review-helpful.html that had adult sizes, which could be used to make something like what you're seeking. I have 2 Mylar blankets that was given to me and i am wanting to use one of them to put in the flannel socks that i want to make can you give me a pattern for this it sure will help when my husband and i go hunting in about 3 weeks . I sure would love to have a pattern for these . Thank you !! !